I used to love to read the British slang in books by C.S. 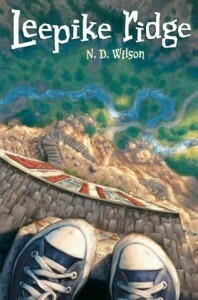 Lewis, E. Nesbit, P.G. Wodehouse, and others. It took me a long time to figure out that those kids weren’t carrying actual torches in their pockets (how? ), but rather normal old flashlights. And “hols” were holidays, any break from school. As for the point above, I believe that English charm was an aspect — just a small part overall, of course — of the appeal of Harry Potter to American readers. The unfamiliar words and expressions helped give the books an otherness that fit seamlessly with the content. I recall that when it came time for Scholastic to publish the American edition, there was some brief conversation about those nettlesome English words and phrases, concern that they might slow down (and thus, turn off) American children. The decision, correctly, was to keep the manuscript as it was on the page. I may have that wrong, and it could well be that Ms. Rowling would have insisted upon it, but there was a least a passing thought about Americanizing the manuscript, which often happens when books are taken across the pond. Anyway, Sherry selects books from these categories: Picture Books, Younger Readers, Middle Grade Readers, Young Adult, Young Adult, and Adult Fiction and Nonfiction. It is always a happy surprise and a great tribute to be included in these recommended lists, along with such respected company. I’ll have to go wash up, put on something nice. Maybe a sweater vest or something. Thank you, Sherry, whoever you are! Glenn Close’s sister Jessie and Jessie’s son Calen have a disease. And even though their story is their own, it’s far from unusual. The fact is, one in six adults has a mental illness. The harder reality is that the ignorance that fuels the stigma associated with mental illness can often be the most painful part of managing the disease. 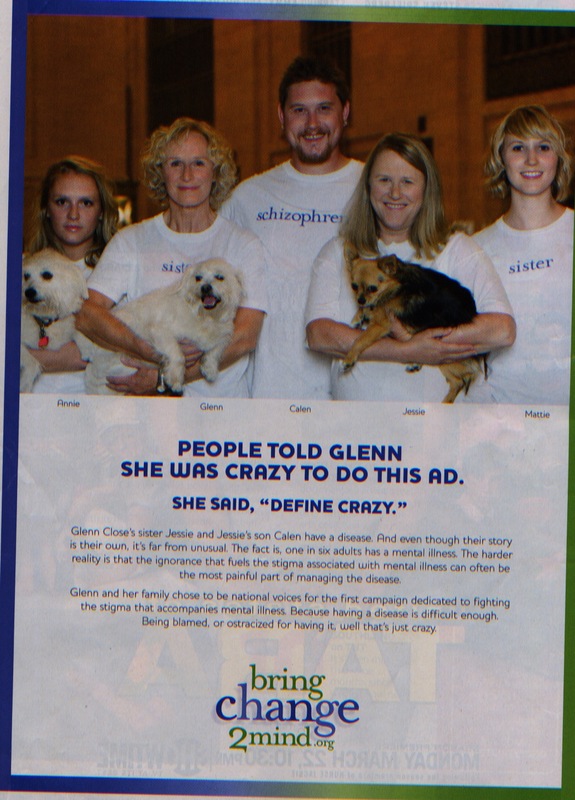 Glenn and her family chose to be national voices for the first campaign dedicated to fighting the stigma that accompanies mental illness. Because having a disease is difficult enough. Being blamed, or ostracized for having it, well that’s just crazy. Readers of Bystander may suspect that I have some personal experience with schizophrenia. And it’s true: my brother John suffered from schizophrenia. I touched upon John’s experiences in a fictionalized way in that book, and also blogged about it more directly here. As an actress, I have always loved words. I believe in their power. But certain words have power over us — until we destigmatize them and learn to speak them out loud, without fear or shame. My aha moment hit me several years ago, when I realized that three deeply frightening words had power over me: schizophrenia, depression, and bipolar. There is mental illness in my family. And I knew that if I really wanted to help, I would have to learn to say those words fearlessly, out loud. That’s the beginning . . .
And my aha moment is beginning to have repercussions. 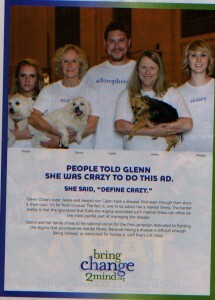 A group of us, along with Fountain House, are launching a campaign called Bring Change 2 Mind. In June we went to Washington and presented our idea to the major mental health organizations. With their enthusiastic blessing and support, we shot our first public service announcement— in Grand Central Station — directed by Ron Howard. Jessie and I and our children are in it. And John Mayer gave us use of his exquisite song “Say.” Bringchange2mind.org has links to all the major mental health groups. It will connect people to whatever they need: help, community, education, or a chance to join one of the organizations. I congratulate Ms. Close on the courage of her convictions, and the bright shining power of her insight. This is good work; I believe she’s right. We need to talk about this stuff, not hide from it, because there is a power in words — a power to do harm, and a power to make positive change. I’ve always loved the writing process, how a jumbled ball of yarn becomes an actual sweater. Conversely, it’s amazing to me — pulling on that thread and watching how the fabric unravels. I have an idea for a character who gets into trouble at school. The book is about this kid, and, in part, the surprising relationship he builds with the school principal. But how and why does this boy get into trouble? What does he do? What kind of hilarious escapades can I conjure? Then one notion hit me over the weekend: He smuggles a goldfish into school! I love that idea. I can WORK with that idea. That is: There are possibilities that appeal to my sensibilities. So then begins the series of questions: How does he do it? Why? What goes wrong (because something must go wrong)? I’ve already daydreamed over a host of options — involving a thermos, soup broth, and a swallowed goldfish — but I know I’m not there yet. 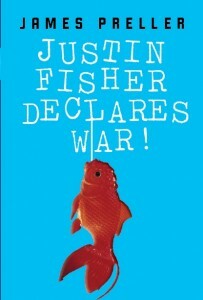 Below, please find a brief scene from my upcoming middle-grade book, Justin Fisher Declares War! (Scholastic, August 2010). The scene represents the realization of those bloggy wonderings. Yesterday I read this passage aloud to a group of foruth-graders. We’d been talking about the importance of asking “what if” questions. In this case, what if a boy wanted to smuggle a goldfish into school. How might he do it? The answer to that question is the scene you write. If writing fiction is anything, it is asking “what if” questions, following the logic and playing with those possibilities — thinking it through. After all, “what if” questions are at the core of what’s now called “Speculative Fiction” and, I hasten to ask, what brand of fiction is not speculative? We’re all daydreamers here. Justin understood that he’d never get past the front door carrying his sister’s goldfish bowl. She’d freak out and wail like a siren, and his mother would end up yelling. No, Justin needed to come up with a foolproof plan. And after a few minutes of heavy-duty thinking, he did. The next morning, he asked his mother for tomato soup for lunch. “You never eat it when I give it to you,” she said. “Soup Day?” His mother raised an eyebrow. Operation Goldfish was in effect. At the next opportunity, Justin snuck into the bathroom, dumped out the soup, and rinsed the thermos clean. Then, on tip-toe, he entered the forbidden zone — his sister’s room. The room itself was hideous, a monstrosity of purple and pink, with Disney posters and stuffed animals. Justin couldn’t imagine how his sister managed to sleep in there. Justin paused by the door, listening. Lily was downstairs, eating Pop-Tarts. 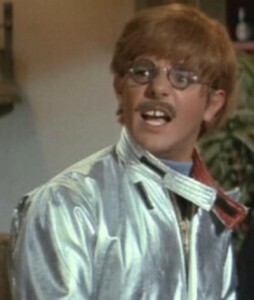 Justin poured water from the goldfish bowl into the thermos, spilling only a small puddle on the rug. With a net, he fished out the goldfish and dropped it into the thermos. What about air? Justin wondered, as he screwed the cap on. I can’t suffocate my sister’s fish. He thought about trying to find a hammer and nail. Maybe he could drive small holes into the screw top. “Coming!” Justin hollered. He placed the thermos back into his lunch box, stuffed that into his backpack, and hustled down the stairs. He figured he’d open and close the cap every hour or so, just to make sure the goldfish got enough air. He might have been a little mischievous, but he wasn’t a cold-blooded fish murderer. I’ve called this “my rebound book,” since it comes after the more serious, precise Bystander. This one is loose, light, short, funny. Rereading my early notes from the blog, I realize that I changed Justin’s relationship from the principal to his classroom teacher, Mr. Tripp. That struck me as more immediate, more natural, and allowed me to make his teacher more sympathetic. Originally, I conceived of the teacher as sort of a one-dimensional uptight obstacle, but it got much more interesting when he became a well-rounded person — a first-year teacher, nervous and well-intentioned, who makes some mistakes in handling an attention-seeking student. 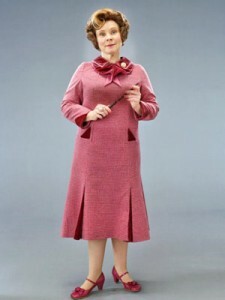 Aside: I think the single worst character in the Harry Potter series — the character I consider a major failure — is the one-dimensional Dolores Umbridge, appointed High Inquisitor of Hogwarts in the fifth book, Harry Potter and the Order of the Phoenix. 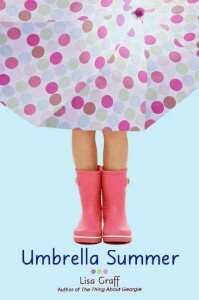 Lacking all shade and substance, she ruined much of the book for me. I hated her, but not in the way J.K. Rowling wanted me to hate her. There’s nothing quite like the first sentence in a book. After all, it’s the first. Numero Uno. Isn’t that what we all do, in bookstores and libraries? We scan the cover, read the flap, crack it open and read the first few lines, maybe a paragraph or two, and . . . DECIDE. How do you NOT read the next sentence? An ax! Daddy? I’m alarmed, almost as much as Fern. Where IS he going with that ax? Again, wow. Those words, “come” (not “came”) and “us” signaling a rural voice and setting, a voice we’ll grow to love, to root for, a voice that will pull us all the way through. Nothing fancy here. But again: setting, character, and foreshadowing in one simple sentence. A grammatical aside: I love the lack of commas in that description of the endless green nothern wilderness. It is my hope that this post leads to some kind of discussion, responses, comments. So please — readers, teachers, students, librarians, dogs who can type — what’s your favorite opening sentence? Maybe we can grow this into something. Create a list. Vote. Any students out there? What makes a great first sentence, anyway?